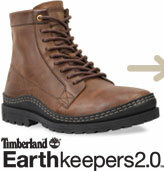 Timberland has launched for Fall/winter 2009 collection the line Earthkeeper, as its name says are boot that are done with recycled materials and can be recycled over and over. Outsole material comes from Green Rubber, a Malaysian company that has developed a method for devulcanizing waste tires. Vulcanized rubber is created by adding sulfur and heat to virging rubber to get a harder and more durable material. Products like car and shoe soles are done with this. Problem is that vulcanized rubber is really difficult to recycle and Green Rubber Company found a way to recycle and decompose it to get and offer their product as 100% green rubber or a mix 50% green rubber + 50% virgin rubber. Timberland is the first company using the 50/50 blend in the outsoles of their bots, meanly on Earthkeeper collection and in men’s rugged casual products. When shoes made with Green Rubber wear out, the soles can be reused by the Green Rubber company and recycled again, and Timberland is working on a plan for how to take back and disassemble boots. If you’ve already purchased a pair of Earthkeepers 2.0 boots then sing up into their web site www.earthkeeper.com and you will receive information to get information about what to do when your pair are done.